Mutual Fund advertisement an example of financial illiteracy? I have been reading lot of articles on moneylife.in one of the effective blog on the financial awareness for retail investors. Indian mutual fund houses seem to have finally cracked the code for attracting investors from outside the big cities. More than half the folios, or accounts, opened in 2013-14 under a Systematic Investment Plan have come from tier-II or smaller cities — known in sector parlance as B-15, meaning, beyond the top 15 cities. 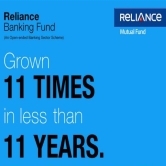 Will not explore on the data much, lets take the example of a Reliance mutual fund claiming that it has grown 11 times in less than 11 years. This compared to the benchmark—CNX bank Nifty, that has grown about eight times over the same period. The return on paper looks great and is enough to lure an average investor. But is the Reliance Mutual Fund add an example of financial illiteracy? To make a correct choice, investors need to look beyond the performance on a point-to-point basis. Investors need to look at the performance of a fund over multiple periods. 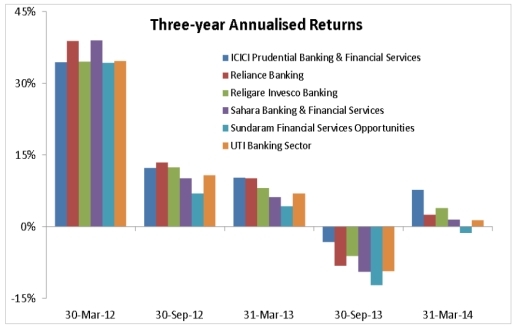 From December 2010 to March 2014.Over this period, the returns of the scheme have been inline with the benchmark performance. No great outperforming. Likewise, investors need to look at comparative performance over different periods, periods when the sector performance has declined, and when the sector has remained flat. Comparing the performance, over these periods, for multiple schemes of the same category will help you pick one of the best. Reliance is crowing about its long-term performance as it is the only scheme that has a track record of around 11 years. Most of the banking schemes were launched in 2008. However, if you look at periods of over the past few years, you would get a clearer picture of the performance of different schemes under the same category.